The Greaves Duo of Johnny and CJ Greaves along with Yamaha Racing team of Rodney VanEperen, Adam Reek, and introducing Gray Leadbetter continued their participation in the Lucas Oil Midwest Racing League this past weekend at Bark River International Raceway. Johnny and CJ account for more than 38 wins spanning nearly 20 years leading up to the weekend’s racing. Bark River, located in the U.P. of Michigan, features great dirt, long downhill runs, blistering rhythm sections, and huge jumps. It is a fun track, but one that will punish you if you are not on top of your game. The Greaves boys traded trips to the top of the podium in Pro-4 with CJ taking the win on Saturday and Johnny on Sunday. CJ’s dominated in Pro Stock UTV only to have a flat tire knock him off the podium on Saturday. He rebounded on Sunday to take the win. Adam Reek had his best showing of the year with a 3rd place podium finish on Saturday. Rodney VanEperen held on to his Pro Mod UTV points lead with a 2nd place and a win. 13-year-old Gray Leadbetter, part of Greaves Driver Development Program, made a great showing with a 12th place finish in her first short-course offroad race in the Sportsman Stock SxS UTV class! She followed that up with an amazing 7th place finish in Sunday’s race in a field of 23. SATURDAY: Five trucks rolled off for the 10-lap Pro 4×4 race on Saturday. Johnny in his Monster Energy/ Maxxis Tire/ Toyota and CJ in his Monster Energy/Mutant Soda Toyota were patient while some of the track water dried up and they began to put on a show for the Bark River crowd. CJ and Johnny picked off the front-runners, and by lap 4, CJ had taken the lead with Johnny in tow leading up to the competition caution. The 2nd half of the race saw Johnny trying his best to find a way around CJ. They were nose to tail, side-by-side, and even a little family friendly contact on the final lap. CJ prevailed to take the win with Johnny right on his bumper. “That track was so much fun to drive it should be illegal,” said Johnny following the race. The elder Greaves still maintains his points lead. SUNDAY: The tables turned for the Greaves Duo in Sunday’s race. Johnny took the lead on lap one and never looked back. CJ was quickly in the 2nd place spot setting up a rematch of Saturday’s race. The two Greaves were nose-to-tail on the final lap. One slip by the elder Greaves would have meant a sure win for CJ. However, Johnny held his lines and took the win followed by CJ. on the front row of the huge field of more than 29 in Saturday’s Pro Stock Side-by-Side UTV action. CJ jumped out to the lead after the 2×2 rolling start, which did not last long when a 4 or 5 car pileup in turn 1 brought out the yellow caution flag. The domino effect collected several vehicles, which took a while to untangle. CJ took the holeshot and the lead on the restart followed by Masch and teammate Adam Reek with one of his best starts of the season for Yamalube/Maxxis Tire UTV. Waszak and Reek battled for the 3rd spot on the podium. CJ continued to lead the pack up to the competition caution with Reek now in 4th. On the restart, CJ continued to dominate the field. Pulling out to a nice lead. Things were going great until 1 lap to go when disaster struck. CJ developed a right rear flat which allowed the top 5 to pass him. Masch took the win followed by Brian Waszak and Adam Reed with his first podium of the year. CJ finished 6th after leading the entire race. SUNDAY: CJ Greaves was looking to rebound from Saturday’s disappointing Pro Stock SxS UTV loss due to a late race flat. Adam Reek was hoping to make another podium appearance and improve his points position. CJ started on row 3. When the green flat flew, CJ went to work. In 4th, CJ and Pointen battled side-by-side with CJ making the pass on lap 2. Adam Reek was buried in traffic and not finding much luck advancing. CJ passed Martin with just a couple of turns left before the competition caution with Waszak still holding on to the lead. When racing resumed, CJ went to work on Brian Waszak. The pressure got to Brian who went on 2 wheels in one of the turns allowing CJ to take the lead, which he held to the end of the race. SATURDAY: Rodney VanEperen started on the pole in Saturday’s Pro Mod SXS UTV class race make up of more than 20 cars. When the race went green, Rodney took the holeshot with Kyle Chaney on his tail. VanEperen and Chaney did battle the entire race. Chaney took the lead briefly on the restart following the competition caution but VanEperen’s Yamaha regained the lead when Chaney went wide in the cemetery turn. The top 3 checked out from the rest of the field. Rodney held on to take the win followed by Chaney in 2nd. SUNDAY: Rodney rolled off his PowerSports1/Maxxis Tire Pro Modified UTV from the pole position once again in Sunday’s Pro Mod SxS UTV racing action. Rodney took the holeshot, using his roost to hold the hard charging Chaney and Farr at bay. On lap 3, Chaney was able to make the pass on Rodney’s machine and that is the way it remained until the competition caution. The top 2 put on a show for the more than 20 thousand fans in the second half of the race. They went back and forth and on the final lap, Rodney had a wheel beside Chaney as the two took the checkered flag. Chaney took the win with VanEperen coming in a very close second. “That was the ‘funest’ 2nd place finish I have ever had,” said VanEperen following the great race between he and Chaney. Rodney remains atop of the points standings following the weekends racing. Greaves Motorsports is proud to introduce Gray Leadbetter to their Driver development program. 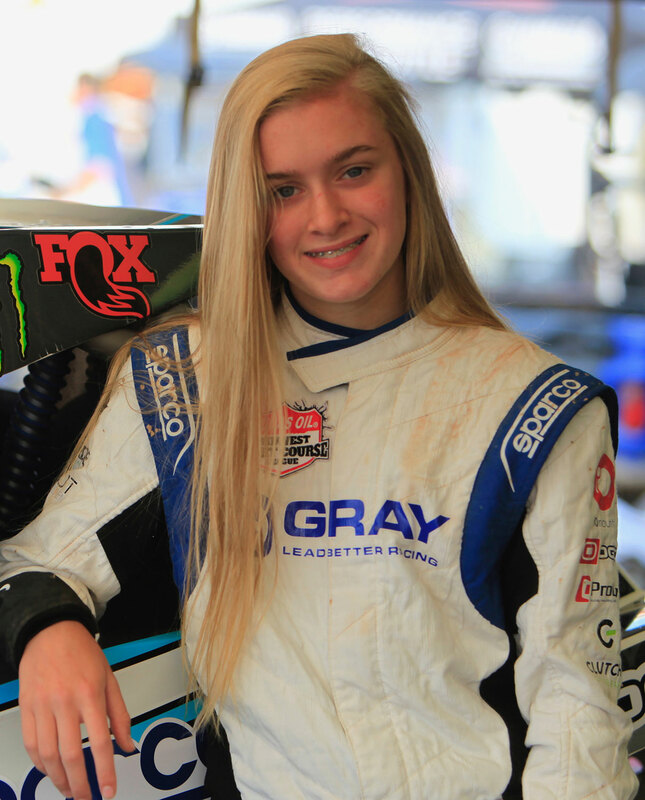 At age 13, Gray Leadbetter, of Morganton, NC, is already an accomplished racer with national kart championship wins, including being the first female to win a USPKS National in the IAME Junior division (2017) and she is the 2017 GoPro Motorplex Karting Champion her rookie year. She is also a top contender in Mini Outlaws and has won championships in regional indoor and outdoor motocross. She is a diverse driver who has her own Ford Fiesta rally-style car and is the youngest person to drive in a Supercar lite at FlatOut in Sweden and at Dirt Fish Rally in Washington. She trains regularly at the Bondurant racing school in a Dodge Hellcat, a Dodge Viper, and a Formula Mazda, and is also the youngest to do so. SATURDAY: Gray started her Sparco, Clutch, Iomounts number 28 in the back of the huge field of 23 UTV’s in her first short-course off-road race from the 21st position due to the points inversion. However, starting in the back did not deter her. Her prior racing experience helped her whittle through the traffic and within a few laps, she had made her way all the way up to the 12th position. As she was making the pass for 11th, the opposing driver pinched her off in a turn forcing her into a tire, resulting in a spinout, which dropped her back to 18th. But Gray did not give up. She began to steadily pick-off opponents one-by-one, making her way back through the pack to finish an impressive 12th in her first race at Bark River. SUNDAY: Again starting in the back of the field in 20th, Gray, was excited for a new day of racing. With one race under her belt, she had some experience on the technical Bark River track, and was ready to improve on her 12th place finish on Saturday. Gray had a great start and moved up quickly. Her resilience paid-off as she worked her way up to a remarkable 7th place position at the checkered flag, making a satisfying ending to her first weekend of short-course racing! “I feel the weekend was successful in many ways as I had good results, a lot of seat time, I was able to watch and learn from other great racers, and the crowd was awesome!” said Gray of her first weekend of racing in Bark River. 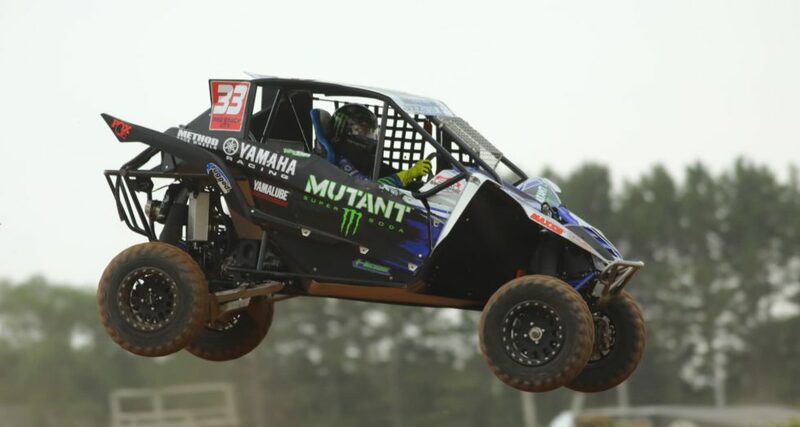 Next up for the Greaves Duo and Yamaha Racing Team is none other than Crandon International Race Way in Crandon, Wisconsin on the extremely popular Labor Day weekend of racing – August 31st through September 2nd. The weekend of racing includes full days of Sportsman and Pro Class races, The World Championship races, and the AMSOIL Cup Challenge.